The focus of next-generation 3D research is on the so-called virtual-viewpoint (or free-viewpoint) video system. It is also an on-going standardization item in the international ITU/MPEG Standards. Typically, a densely arranged camera array is used to acquire input images and a number of virtual view pictures are synthesized at the receiver using the depth-image based rendering (DIBR) technique. 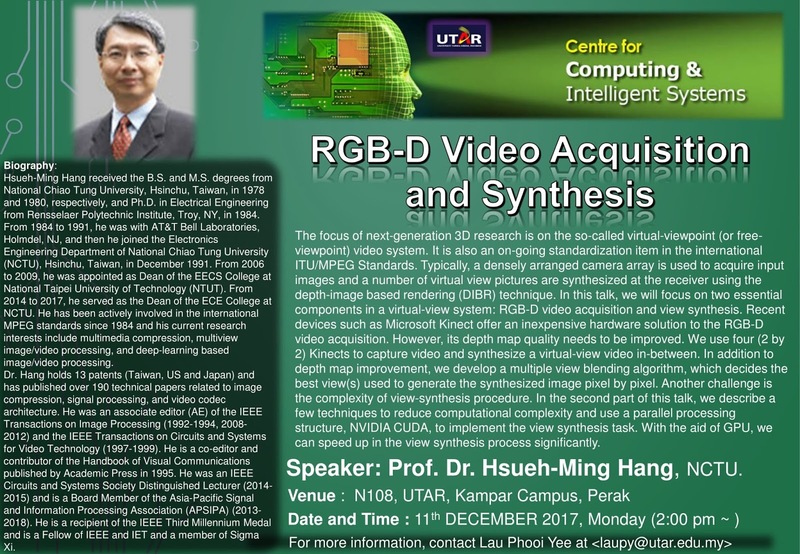 In this talk, we will focus on two essential components in a virtual-view system: RGB-D video acquisition and view synthesis. Recent devices such as Microsoft Kinect offer an inexpensive hardware solution to the RGB-D video acquisition. However, its depth map quality needs to be improved. We use four (2 by 2) Kinects to capture video and synthesize a virtual-view video in-between. In addition to depth map improvement, we develop a multiple view blending algorithm, which decides the best view(s) used to generate the synthesized image pixel by pixel. Another challenge is the complexity of view-synthesis procedure. In the second part of this talk, we describe a few techniques to reduce computational complexity and use a parallel processing structure, NVIDIA CUDA, to implement the view synthesis task. With the aid of GPU, we can speed up in the view synthesis process significantly.